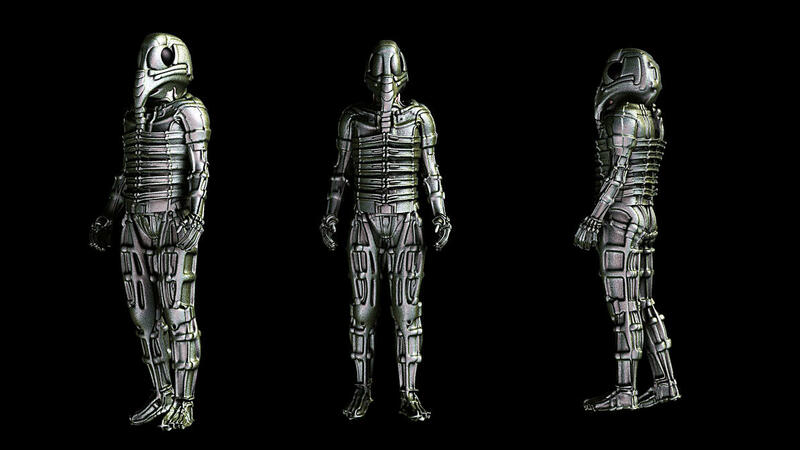 The standard Biosuit for the Chrymerion people. The BS-001 is a skin tight suit that is comprised of living fibers and fluids and attaches to the users nervous system by "Threading" micro-tendrils through the pores. 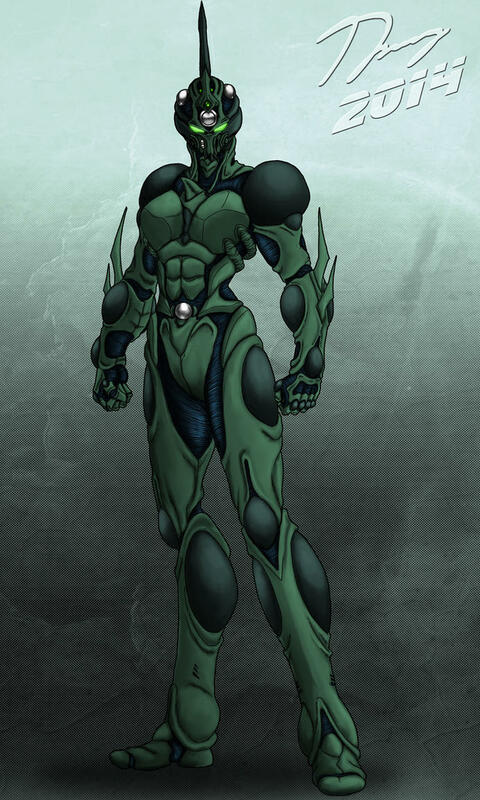 The tendrils then allow the user and the suit to share bodily fluids, nutrients and abilities and makes the user immune to toxins and mutagens by a complex fluid and tissue scrubbing system. As an end result, the suit amplifies the users strength by more than 1000% and increases the users speed and agility by more than 500%. Reaction times and quadrupled and the suit & wearer both have a minor regenerative ability. This is done by the suit altering some of the users bodily fluids into a gel that seals the injuries and literally regrows dead tissue, organs and bones if need be. All this is done by combining the mutagenic virus that has been altered with nano-technology. 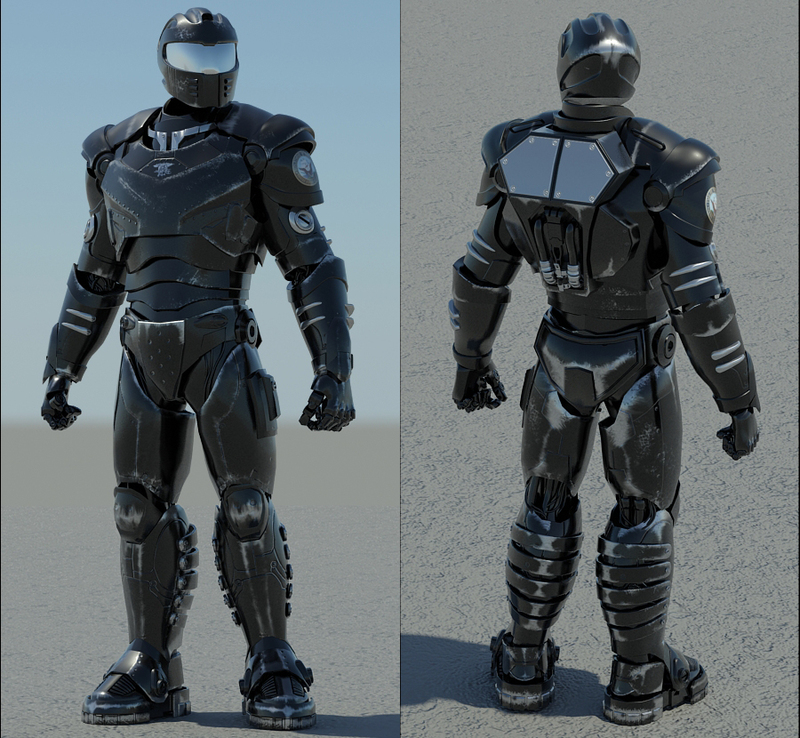 The suit is able to be stored within the users body as a semi-gaseous and semi-liquid state. When needed, the user mentally orders the suit to form around them in less than three seconds. The same process is used to take it off and store it back inside. This is done via the pores and a micro adapter on the base of the neck which transmits & receives data from the brain and suit. It is also a bio-computer that ties into the users brain directly and allows hands free control of any and all Chrymerion system that the user has access to. The BS-002 is the 2nd of the standardized biosuits. The BS-002 is fitted over the BS-001 and attaches to the BS-001 via tendrils which "Thread" as well. The two suits then adjoin and become a single unit. Further enhancing the strength and endurance of the user, the BS-002 also supports a heavily armored frame which is highly resilient to damage. Impervious to corrosives of all kinds, the BS-002 reduces energy and kinetic damage by more than 70%. The BS-003 is a Combat upgrade of the BS-002. 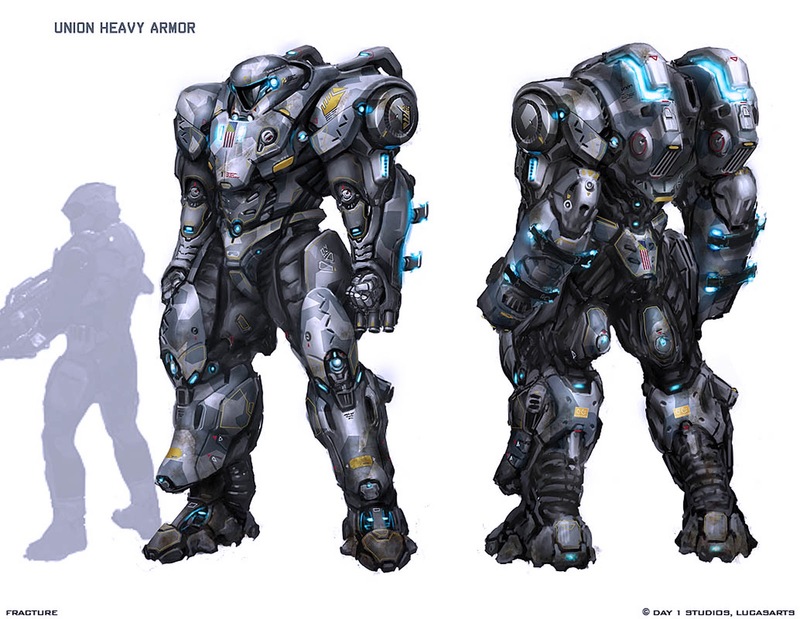 Further enhancing the regenerative properties of the user and the suit, the BS-003 is in all sense of the words a "Heavy Assault" armor. By "Threading" onto the BS-002 upgrade, the BS-003 offers greater speed and strength as well as allowing the user to not need to eat or drink while the suit is activated due to absorbing nutrients from the surrounding area as well as sunlight and moisture. The BS-003 enhances the users jumping ability by more than 1000% and also increases the neural pathways efficiency and response times by more than 300%. 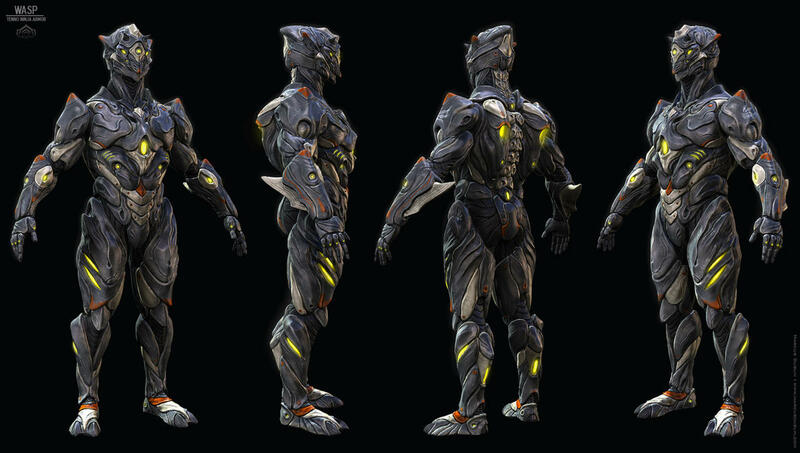 The BA-001 is a mechanical armor with organic tissue underneath which when combined, increases the users strength, speed and endurance. Outfitted with a HUD system, on board A.I. computer as well as a sensor & communications suite. The armor has a rudimentary regenerative ability where the living tissue is able to excrete a gel like substance that solidifies and repairs the armors damage. The BA-001 is capable of taking four or five direct shots from a 200mm cannon no matter if it is kinetic or energy and is impervious to corrosives and makes the user immune to toxins and mutagens by a complex fluid and tissue scrubbing system. The BA-002 is an enhanced Bioarmor that "Threads" onto a users BA-001 and the two units become a single unit. The now BA-002 has enhanced systems and better regenerative properties. The on board A.I. connects into the neural node on the Chrymerions neck and the suit is entirely neural operated now with no more need for vocal or movement commands. The suit also "Threads" into any weapon that the user is using at the time and allows a point and shoot operation granting an almost perfect shot every time. 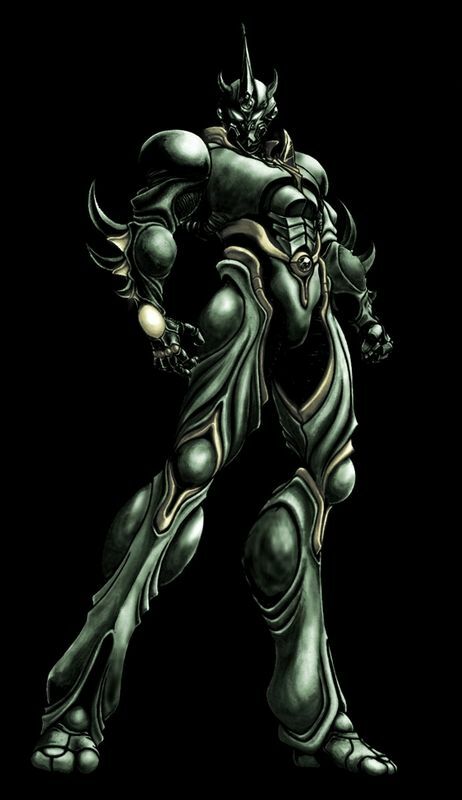 The suit has the additional side effect of any dormant mental abilities are brought forth whenever the suit is in operation and after prolonged exposure to the suit, the mental abilities (Psionics) become permanent. 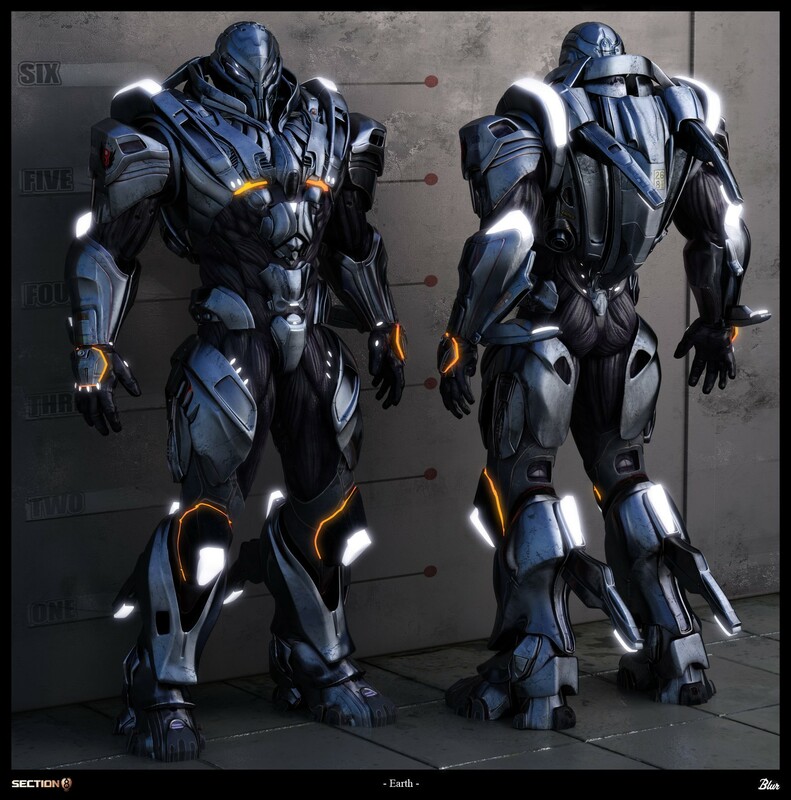 The BA-003 is an enhanced Bioarmor that "Threads" onto a users BA-002 and the two units become a single unit. The now BA-003 has enhanced systems and better regenerative properties than the BA-002 and is able to operate in Zero-G and underwater environments through the use of several repulsor vents. The on board A.I. connects into the users node and merges with the users brain and is entirely neural operated with the user having a brain with the precise memory and calculative ability of the computer. The suit also "Threads" into any weapon that the user is using at the time and allows a point and shoot operation granting an almost perfect shot every time. 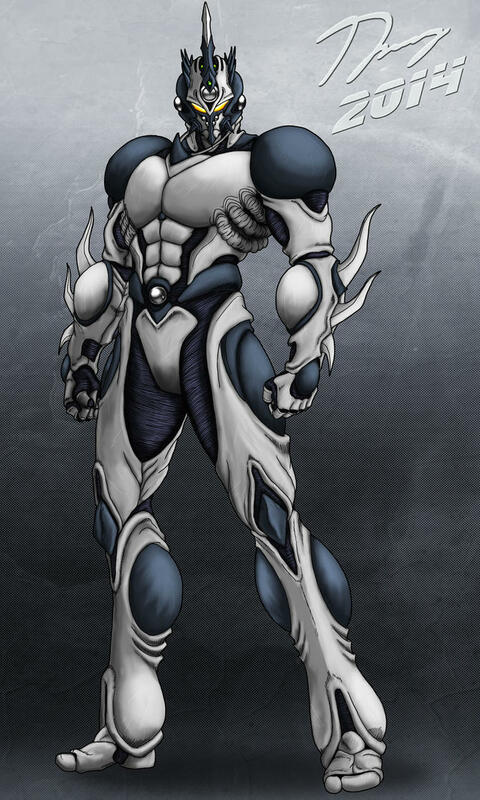 The suit has the additional side effect of any dormant mental abilities are brought forth and within days are made permanent and with some training, the users powers will be manageable and over time will be increased in power, range and sensitivity. 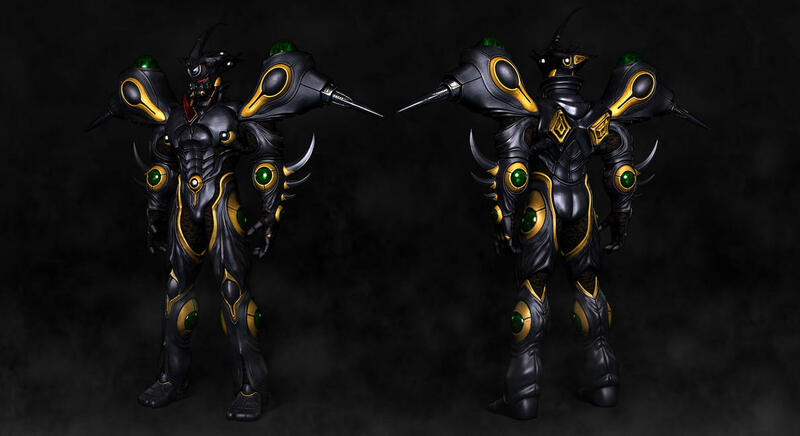 The RBA-001 is a suit of BS-003 that upon "Threading" was enhanced by the Chrymerion royals body which caused it to further mutate and improve upon itself. With everything that the BA-003 has, the RBA-001 has the added enhancements of being less bulky, lighter mass and improved agility. It also develops blades that are able to grow and shrink depending on the users will. The head also develops a horn blade that is able to grow and shrink. Several "Nodes" form over the body and these serve as additional sensory organs. The RBA-002 is a suit of RBA-001 that upon "Threading" onto a BS-003, was enhanced by the Chrymerion royals body which caused it to further mutate and improve upon itself. With everything that the RBA-001 has, the RBA-002 has the added enhancements of being even less bulky, lighter mass and improved agility. In addition, the suit develops a reactionary sense that when the user is in danger, the suit can activate automatically without the user even knowing danger is coming. The RBA-003 is a suit of RBA-001 that upon "Threading" onto a BS-003, was enhanced by the Chrymerion royals body which caused it to further mutate and improve upon itself. With everything that the RBA-001 has, the RBA-003 has the added enhancements of being even less bulky, lighter mass and improved agility. In addition, the suit develops a reactionary sense that when the user is in danger, the suit can activate automatically without the user even knowing danger is coming. A deep red in color with glowing blue energy, the RBA-003 is also capable of discharging destructive Psionic energies from the hands, forehead and chest. The blades which are able to shrink and grow are also enveloped in a psionic field which allows them greater damage potential and effectiveness. The RBA-004 is a suit of RBA-001 that upon "Threading" onto a BS-003, was enhanced by the Chrymerion royals body which caused it to further mutate and improve upon itself. With everything that the RBA-001 has, the RBA-003 has the added enhancements of being even less bulky, lighter mass and improved agility. In addition, the suit develops a reactionary sense that when the user is in danger, the suit can activate automatically without the user even knowing danger is coming. Unlike the other armors, the RBA-004 is capable of cloaking and becoming completely invisible to all senses as well as electronic means. Even enhanced sense of smell and vibration sense don't pick the suit up. However, the cloaking is able to only be used for thirty minutes at a time upon which if still in use, the field drops and can't be used again for another three hours while it recharges. The RBA-005 is a suit of RBA-001 that upon "Threading" onto a BS-003, was enhanced by the Chrymerion royals body which caused it to further mutate and improve upon itself. With everything that the RBA-001 has, the RBA-005 has the added enhancements of being even less bulky, lighter mass and improved agility. In addition, the suit develops a reactionary sense that when the user is in danger, the suit can activate automatically without the user even knowing danger is coming. 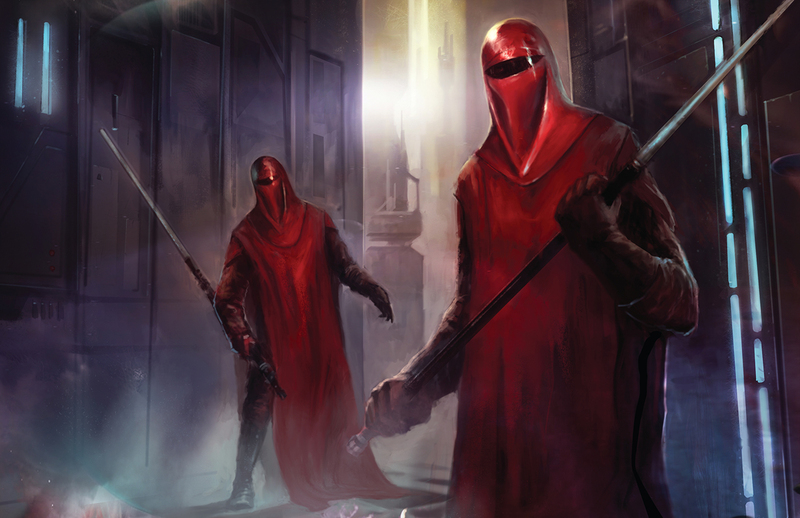 A deep red in color with a menacing head decoration, the RBA-005 is able to generate psionic flames. With temperatures reaching over 7,000 degrees, the psionic napalm is discharged through the hands. 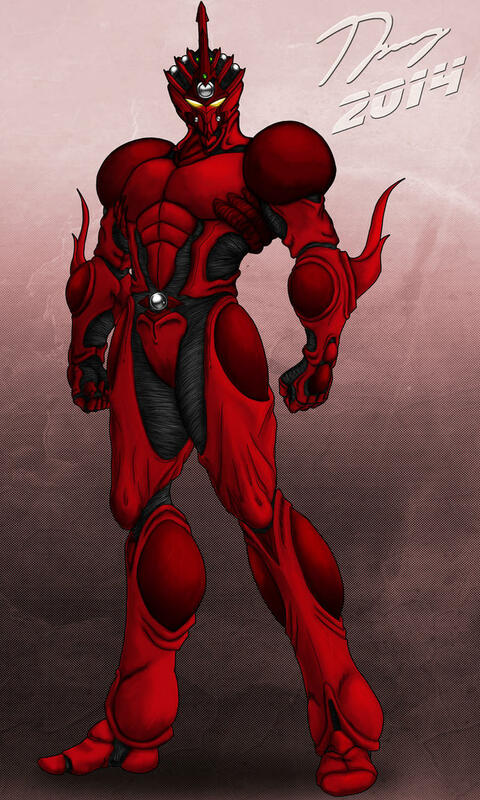 The suit is also able to envelop itself in a fiery aura that reaches over 3,000 degrees as well. The RBA-006 is a suit of RBA-001 that upon "Threading" onto a BS-003, was enhanced by the Chrymerion royals body which caused it to further mutate and improve upon itself. With everything that the RBA-001 has, the RBA-002 has the added enhancements of being even less bulky, lighter mass and improved agility. In addition, the suit develops a reactionary sense that when the user is in danger, the suit can activate automatically without the user even knowing danger is coming. With Psionic enhancing abilities, the RBA-006 is able to discharge psionic blasts from its forehead. It also has a greater sixth sense for danger, telepathic abilities not just one on one but can link any RBA suit user within fifteen miles and any non-RBA suit user within ten miles into a collective hive mind with the RBA-006 user as the center point and "Queen" in a sense. The suit also has limited telekinetic flight which can go for an hour before needing to rest for two hours before using again. The user also has a 360 degree vision. The RBA-007 is a suit of RBA-001 that upon "Threading" onto a BS-003, was enhanced by the Chrymerion royals body which caused it to further mutate and improve upon itself. With everything that the RBA-001 has, the RBA-007 has the added enhancements of being even less bulky, lighter mass and improved agility. In addition, the suit develops a reactionary sense that when the user is in danger, the suit can activate automatically without the user even knowing danger is coming. With Psionic enhancing abilities, the RBA-007 is able to discharge psionic blasts from its forehead. It also has a greater sixth sense for danger, telepathic abilities not just one on one but can link any RBA suit user within fifteen miles and any non-RBA suit user within ten miles into a collective hive mind with the RBA-007 user as the center point and "Queen" in a sense. The suit also has limited telekinetic flight which can go for an hour before needing to rest for two hours before using again. The user also has a 360 degree vision and a nearly impenetrable psionic shield that can be used for three hours before needing to recharge for two hours. The RBA-008 is a suit of RBA-001 that upon "Threading" onto a BS-003, was enhanced by the Chrymerion royals body which caused it to further mutate and improve upon itself. With everything that the RBA-001 has, the RBA-008 has the added enhancements of being even less bulky, lighter mass and improved agility. In addition, the suit develops a reactionary sense that when the user is in danger, the suit can activate automatically without the user even knowing danger is coming. With Psionic enhancing abilities, the RBA-008 is able to discharge psionic blasts from its forehead, chest, hands and eyes. It also has a greater sixth sense for danger, telepathic abilities not just one on one but can link any biosuit user within thirty miles and any RBA suit user within one hundred miles into a collective hive mind with the RBA-006 user as the center point and "Queen" in a sense. The suit also has limited telekinetic flight which can go for three hours before needing to rest for one hour before using again. The user also has a 360 degree vision and a nearly impenetrable psionic shield that can be used for three hours before needing to recharge for one hour. The RBA-009 is a suit of RBA-001 that upon "Threading" onto a BS-003, was enhanced by the Chrymerion royals body which caused it to further mutate and improve upon itself. With everything that the RBA-001 has, the RBA-009 has the added enhancement of having improved agility and toughness. In addition, the suit develops a reactionary sense that when the user is in danger, the suit can activate automatically without the user even knowing danger is coming. With Psionic enhancing abilities, the RBA-008 is able to discharge psionic blasts from its forehead, chest, hands and eyes. It also has a greater sixth sense for danger, telepathic abilities not just one on one but can link any biosuit user within thirty miles and any RBA suit user within one hundred miles into a collective hive mind with the RBA-006 user as the center point and "Queen" in a sense. The suit also has telekinetic flight which can go indefinitely with no need for rest. The user also has a 360 degree vision and a nearly powerful force field that can be maintained for days at a time and if knocked down, the shield can be brought back up at a mere thought. 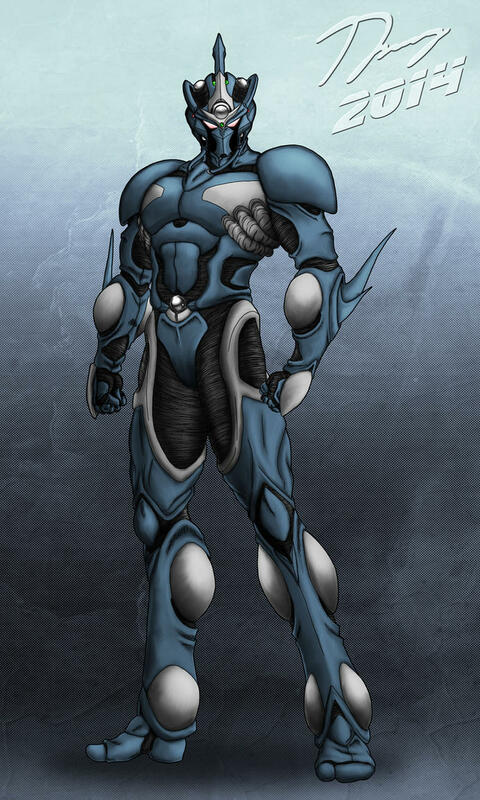 The assault armor of the RBA line, the RBA-009 is the strongest, fastest, sturdiest and most powerful suit of them all. Unique of all Bio suits and armors is the Royal Queen Armor. Only ever formed when the Queen or one of her offspring are outfitted with a RBA-001. 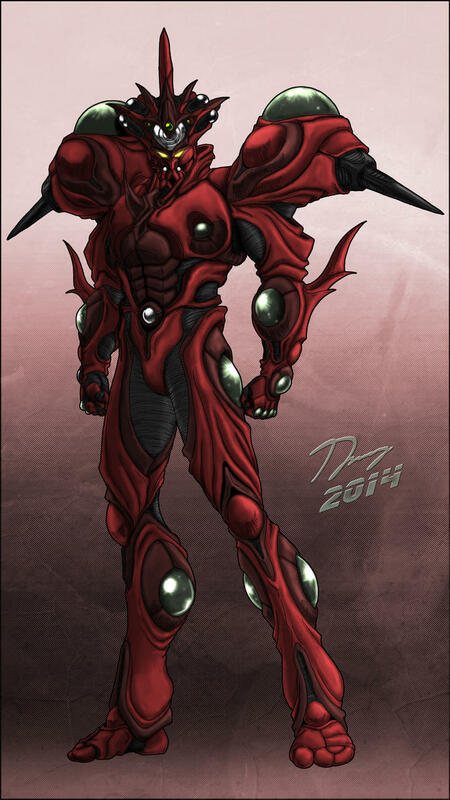 The RQA is a suit of RBA-001 that upon "Threading" onto a BS-003, was enhanced by the Chrymerion royals body which caused it to further mutate and improve upon itself. With everything that the RBA-001 has, the RQA has the added enhancement of having improved agility and toughness. In addition, the suit develops a reactionary sense that when the user is in danger, the suit can activate automatically without the user even knowing danger is coming. With Psionic enhancing abilities, the RQA is able to discharge psionic blasts from its forehead, chest, hands and eyes. 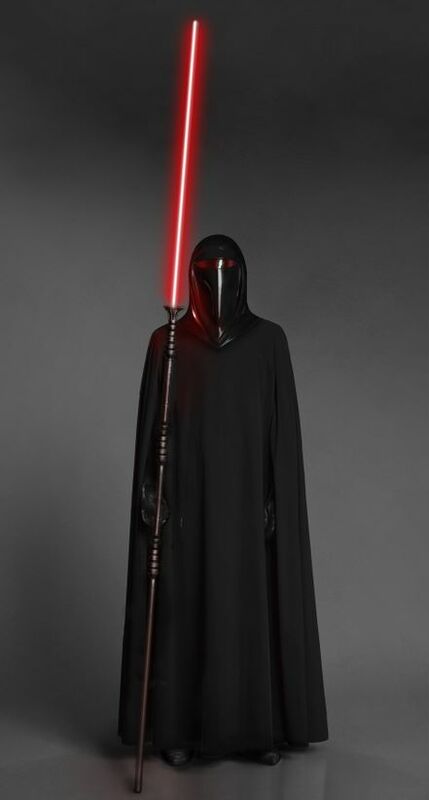 It also has a greater sixth sense for danger, telepathic abilities not just one on one but can link any biosuit user that is Chrymerion into a collective hive mind with the RQA user as the center point. The suit also has telekinetic flight which can go indefinitely with no need for rest. The user also has a 360 degree vision and a nearly impenetrable force field that can be maintained for days at a time and if knocked down, the shield can be brought back up at a mere thought. The RQA is the strongest, fastest, sturdiest and most powerful suit of them all.